Ive just released Neon Prime HD for the Playbook. I coded the game using tier 1. It is a retro style vertical space shooter with the player fighting through 5 levels and boss fights. It has a level select mode that allows the player to play the games 5 levels, and play 5 extra extreme levels. Im currently getting it upgraded to 1075 for Android and the iPad so it can have online score boards and a free version with ads. Apart from the HD version which is a direct port of my Xbox360 XBLIG Im also developing a mobile version that will run on Android, and the iPhone. Thanks. If all goes to plan the Android HD version will be out tonight. Im currently porting it to 1075 right now. Quote: "Android HD version will be out tonight"
Why dont you post your tube videos like this ! Will give you a better feedback from people. Not sure I like the controls, I don't like having my fingers in the way. But it's hard to make good controls on a small touch device. You do place the ship above the finger so maybe it's all good. The Android version has been delayed to later today Im just getting the online score system ready. Digital Awakening I tried a number of controls like tilt, virtual joystick, and dpad but all didnt feel right. The current control setup is the most responsive though the drawback is that enemies below you can be hidden by your hand. very cool! 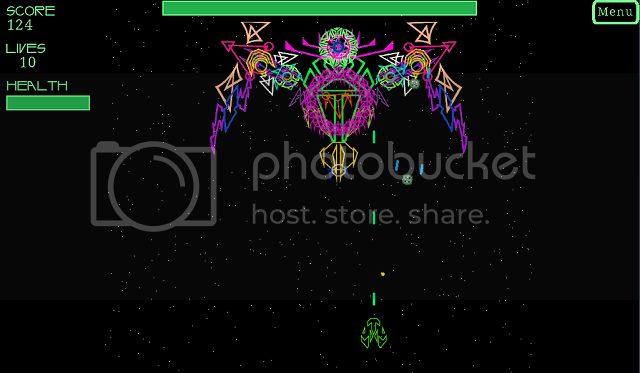 The boss stage looks like some old vector graphics games as Asteroids or others. What on-line scoring system are you using? Im using my own on-line scoring system right now built using the google app engine. Its coded and Python, and right now it allows the player to view the top 10 scores, the top 10 players (unique names), and the last ten scores. I plan to do my own on-line scoring as well. It helps when you have the assets and ability to do such things. Good luck with the game. Please let us know when it is available in the other platforms. I look forward to trying it. Wow, really excellent looking game. Love it! Edit: Bought it... downloading to PB now! Thanks for the complements guys, and thank you baxslash for buying the game! Ive published it now for Android and ill post a link to it when its available. I decided to release it for free with ad support on Android due to no one ever paying for anything on that platform! The next step is to have the game ready for the iPad which I can have done by tomorrow. This is simple enough as Ive only got to switch the game from its current 1024x600 resolution to 1024x768. Heres the link to the Android version. Its the HD version so it best played on a tablet or high end phone. I should have the mobile versions for Android, and the iPhone some time next week. It worked pretty well on my zte skate with only an 800 mhz cpu. Worked well when returning to the game from the add with the back button. Only suggestion is that i had an hard time to see the dark blue enemys? Maybe add an slight glow to make them stand out more? Thanks. Cliff the zte skate although it has a large screen its resolution is only 800 x 480 (same as my desire z) which is why the dark blue enemys are hard to see. Dont worry though as ill be working on getting a low resolution version of the game out some time next week. This version will be played in portrait mode and the levels are remade for phone play. Not really a game for me but best game I've seen so far made in AGK. I wouldn't buy it, but maybe something for those into this kind of game. Clicked on an add. Whatever that gives you. Thanks Digital Awakening. Dont worry about the iPhone version as its a different game. The levels have been remade to suit the smaller screen. I released a beta of the mobile version last year on Android which was coded in Python, and the beta helped me tweak the game for phones. But that version wont be ready for Android and iPhone till next week. Ive almost finished porting the game to the iPad which Ill post a video of when Im finshed. Great to here that baxslash! Its been a good 24 hours for Neon Prime on the PlayBook. First it got a good review on crackberry.com http://crackberry.com/blast-through-space-neon-prime-hd-blackberry-playbook and now its in the top paid app section in the PlayBooks App World! Since then the sales have exploded. They want a online scoreboard system (Hint get 107 ready for PlayBook). It's now ahead in of Angry Birds Rio in the top paid games! It's amazing what one good review can do. Iam very happy for you ! Head of the list in four days!!!!! Yup, I just installed in on my hubby's Android. I think I've just taken possession of it (the Android) since he got his iPad3. The first play was fun! Now I have something that competes with the game I've been playing each night on my iPad2. Keep the good games coming! guess i need too work harder too get a good app. Impetus73 can you give me more details. It works fine on my device. What level were you on? Was it campaign, or level select? Was it the first game on it or did you restart the game? Without details I cant reproduce the bug. It was campain, I did not get the level, but I was nearing 50000 points, when suddenly it exited, then I were back to the "desktop", and when I reopened the program, it started from scratch. I'll try again, and see if it happens again. It was the first loading of the program, 2'nd run, I were at the menu and highscore systems between runs. Oh, I got 90000 now, 4th place worldwide I guess it was a fluke... maybe something on my pad caused it. My finger gets worn out from all the dragging, maybe you should have virtual joystick support, as an option? Let me know if it happens again. There wont be virtual joystick controls I spent a week trying to get it to work, but they just dont feel right, and they lag. I use a stylus to test the game due to playing it hours a day to test and debug it. Well done 4th place. I have my own test scoreboard for testing the online scoring which is why you dont see any apocolyp4 scores. I only made 8th place (internet) when I first played (AncntLady) and had fun. I have a suggestion. A player should only need to enter their name once during any game play session. And allowing a few more characters would be nice. I had a lot of fun playing the game and will work at getting my score better. Quote: "Oh, I got 90000 now, 4th place worldwide"
Perhaps apocolyp4 could post the current highscores on here once in a while. The problem with the PlayBook version is that the games coded using tier 1 AppGameKit, so it doesnt have the http commands yet. What Im thinking of doing next week if ive got the tine is to find a way to to add in my own http commands to allow online scoring for it. Once they update the PlayBook version, I know I'll have an impossible task getting high on the leader board. Oh well, I'll still enjoy playing. I'll be more than happy to try it on iOS when it is available. I'm even willing to be a tester for you in that format (I just finished researching how to do that so that I can get some people testing my game before it goes to market). Thanks but the iPad version is finally good to go. Im plannig to have it released a week on Friday. All I need to do is the itunes connect paper work and I can submit it. Tomorrow I start work on the iPhone version. I get 300k+ scores in the game! That was really cool apocolyp4! I was playing along and, once I beat the first boss, decided to suicide with the 9 lives I had (I only lost one half way because I was curious what flying into the ememies would do) since I had felt I'd seen enough. Then it turns out I was second on the online leader board (I'm "me") You're all going down if only I had known. I'll release my secret in a little while. Quick update. Ive submitted Neon Prime HD for the iPad and if everything is fine it will be out on Sunday the 24th of June. Apart from that Ive built a free demo for the game which Ive released on the PlayBook https://appworld.blackberry.com/webstore/content/118170/?lang=en It includes the first 2 levels in campaign mode, and 4 levels from the level select mode. I added a buy button into the demo that when pressed takes the player to the app world store location of the full game. Since the games built using tier 1 and that the PlayBook version hasnt been updated to 107 I had to hack the AGKCommandsTable.cpp file in the tier 1 project to allow open browser support. You can see the button working here. nice, I saw this on Appworld at the weekend, and thought I should come back and download it. Now I know it's AppGameKit, I'm downloading the demo now! Its has online scoreboards like the Android version. Ive still to release it for Android because im getting silly errors building the project for 1076, and I didnt have 1075 backed up. Now that the games out for the iPhone I can now work on my other projects.